Be daring, defy gravity and punch your fears straight in the mouth with Cunning Stunts, a visually surreal and over-the-top evolution to racing in GTA Online, coming Tuesday, July 12th. 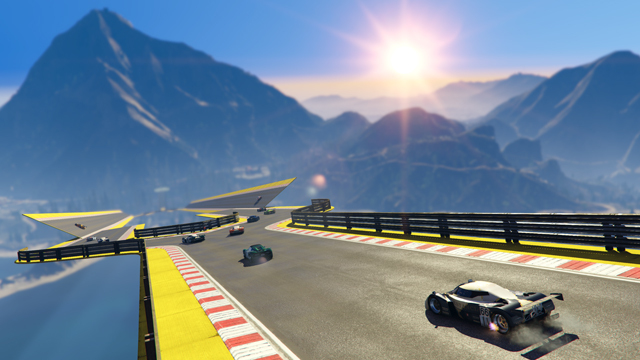 Stunt Races happen on a massive scale, towering above the Los Santos skyline or soaring between the treacherous blades of RON Alternates Windmill Farm. Vehicles tear upside-down through loops and tubes, launch off ramps with extra propulsion from speed strips, diverge and merge across multiple pathways, and speed through gigantic rings of fire in death-defying new Races. Best BF3 player ever "YOLO On The Battlefield"